14 June 1921 – 23 May 1985. Vladimir Abramov (in the aircraft) and Ivan Serbin. Image kindly via Sergey Abrosov. Vladimir Abramov was born on 14 June 1921 in Kuznetsk. When he was 3 years old he lost his parents. He enrolled for service in the VMF in 1939 and completed his training at Yeysk Naval Flying School a year later. After completion of training he joined the 71 IAP-KBF (Baltic Sea Fleet Air Force) and he was to stay on the Baltic Front during his whole career. During the first year of the war he used an I-15bis with the number 30 and an I-153 with the number 42. In July (possibly on 2 July), he took part in the interception of a rare Focke-Wulf Fw 200. 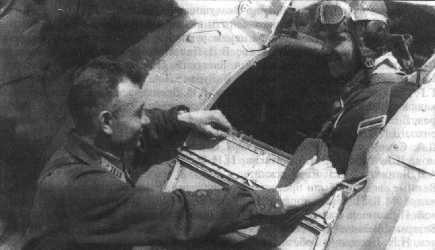 After Abramov’s initial attack the German aircraft was smoking and tried to escape but was then attacked and shot down by two other famous aces, kapitan Alexei Antonenko and Petr Brinko (flying I-16s) of 13 IAP-KBF. After this claim Antonenko and Brinko claimed it for Abramov but Abramov said the two former aces shot it down. This means that the Condor is not included in Abramov’s total claims. On 27 March 1942, Finnish forces invaded Gogland. This resulted in some heavy air combats over the island. At 19:00 on 27 March five I-153s from the 71 IAP led by kapitan Pavel Tshinyakov (and including Abramov) intercepted two Finnish Fokker D.XXIs over the Gulf of Finland and one Fokker D.XXI was claimed shot down. The Finnish fighter crashed on the ice and was claimed as a shared by all the pilots. It seems that the Soviet fighters had been in combat with Fokkers from LLv 30, which didn't suffer any losses. Between 07:45-08:15 3/LLv 24 claimed five I-153s over Lavanssari when lentomerstari Juutilainen claimed two, kersantti Jouko Huotari (BW-353) claimed two and luutnantti Kauppinen (BW-366) claimed one. Additionally, kapitan Solovev claimed one individual enemy aircraft (claimed as a Bf 109) while starshii leitenant Abramov claimed a Finnish I-153. In April 1942, he was wounded twice. In combat over Kronstadt on 24 April, 71 IAP-KBF claimed two Ju 88s shared among seven pilots; two of these being Abramov and starshii leitenant Aleksandr Baturin. On 7 July 1942, 71 IAP-KBF reported fighting in the morning after 06:00 with four I-153s (including Abramov) against four “Severskys” and claiming two shot down near Lavansaari. The only Finnish detachment in the area was a three-plane Brewster patrol of 1/LeLv 24, which reported no contact. These may have been German aircraft. On 13 July 1942, I-153s from 71 IAP-KBF were involved in combat with a reported group of “Severskies” north-east of Someri. One of them was claimed as a shared by kapitan Nikolay Korolyov, starshii leitenant Abramov, starshii leitenant Ivan Minayev and starshii leitenant Ivan Tsapov. It seems that they had been involved in combat with luutantti Joel Savonen’s swarm of Buffaloes from 1/LeLv 24, which reported that they intercepted eight Chaikas in the Lavansaari area between 20:20-21:20. One of the I-153s was shot down over the island by ylikersantti Reino Malin (BW-366). In the autumn of 1942 he became flight commander in the 71 IAP-KBF. From 22 June 1941 to 22 April 1942 he flew 306 sorties of which 70 were ground attack missions and 87 were reconnaissance missions. On 31 May 1943, the 71 IAP-KBF was designated 10 GIAP-KBF. He subsequently was occupied with armed reconnaissance and in early 1944 re-equipped with La-5 fighters. On 19 March 1944, he managed to claim one of the unit's initial victories with the new fighter when he was leading five fighters against a formation of 27 enemy aircraft and downed one Ju 87 personally. On 22 July 1944, he was decorated with the Gold Star of the Hero of the Soviet Union and the Order of Lenin. His last sortie of the war he flew in the same area as his first one. This was very typical for Baltic Front Air Regiments. He ended the war as kapitan and CO of an eskadrillia. During the war, he was also decorated with the Order of the Red Banner (four times), the Order of Patriotic War 1st Class, the Order of Patriotic War 2nd Class and the Order of the Red Star (twice). Abramov ended the war with at least 1 biplane victory and a total of 7 and 13 shared victories. Totally during the war, he flew more than 600 sorties and took part in 65 air combats. Abramov continued to serve for 30 years in the Air Force and was one of the first "Navy" flyers who flew with jets. He retired 1974 and passed away on 23 May 1985. Biplane victories: 1 and 10 shared destroyed. TOTAL: 7 and 13 shared destroyed. (a) Probably claimed in combat with Fokkers from LLv 30, which didn't suffer any losses. (b) Not confirmed with Finnish records. (c) Claimed in combat with Brewster Buffaloes from 1/LeLv 24, which claimed one I-153 without losses. 71 IAP-KBF claimed one Buffalo and it seems that they didn’t suffer any losses.